Moving your family across the country to a new state, city, community, while exciting, can be stressful. This was our situation 4 years ago when we relocated from California to Texas with our children who were then just 3 years old and 9 months old. While we anticipated the stress of the move we didn’t anticipate the peace that began from our very first encounter with our sales team at John Houston Custom Homes. 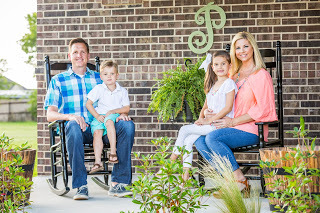 Not knowing the area at all, we relied on our real estate agent who had told us about a beautiful new community in Midlothian called Texanna Ranch by a builder named John Houston that she felt would be exactly what we were looking for. She was right in so many ways. Our family had prayed and prayed for God to guide us to where He wanted us to be and where we would establish our roots here in Texas. We were immediately attracted to the quality and craftsmanship of the beautiful homes in the community. Then we met with one of the sales managers who was oddly from the same area that we had been from in CA and we immediately felt at ease as she spoke of what we were experiencing in this transition and related to us in a way that no one else could have. God no doubt put her there to give us peace and assurance in this process.